Cannon is the alpine venue for hard winter climbing on the east coast. 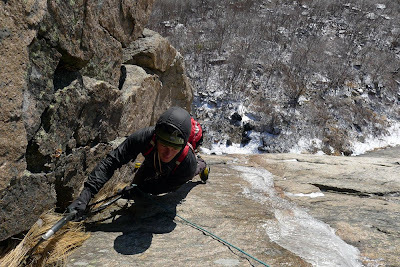 There are many fine ice climbing areas, and there is a ton of cragging sprinkled throughout the northeast, but nothing rivals the climbing on Cannon, which feels much like the harder climbing found in greater ranges around the world. For this reason it's a great proving ground. With the exception of the Black Dike, all of the winter routes on Cannon feel hard. I know, some are thinking that even the Black Dike feels hard. However, when put into perspective at this 1000' tall cliff, the Black Dike is really the only giveaway. I've become quite good at not succeeding at Cannon. My failure rate is pretty high. Four visits this year have only yielded two complete ascents for me. All in all, a 50% success rate up there feels pretty good to me though, and every visit has been a new learning experience. Over the years I've tried Fafnir several times in very early season conditions and been stopped by unbonded thin ice or unfrozen blocks. I've retreated off Omega twice now too. 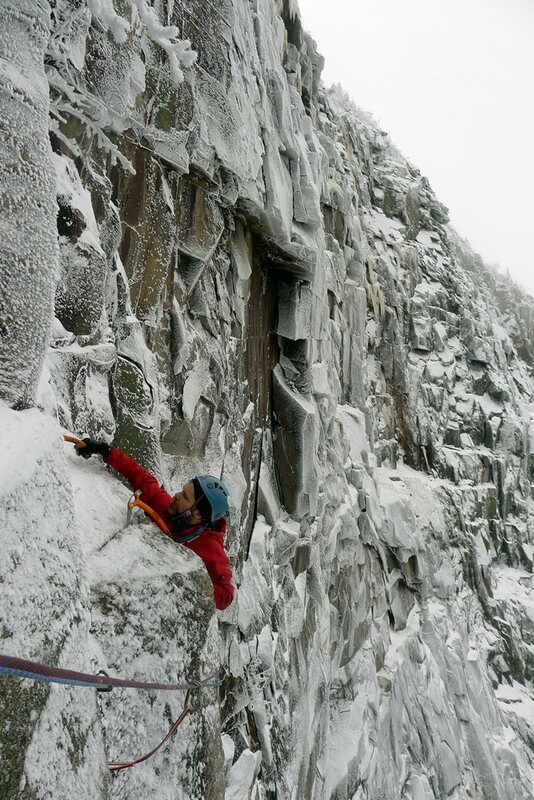 I've climbed the first pitch of Sam's Swan song twice only to be stopped by ice falling off above too. Most days I'm back at the car by 1 or 2, sipping beers in the parking lot. However, every once in a while I'm able hit things just right. Last week, finally, I found some success. After several long rides (2:45 each way from my house in western MA) and short, unsuccessful days this season it was good to spend a full day getting pumped, getting scared and climbing a route I've had my eyes on for years. Elliot Gaddy near the top of pitch 1 on SSS. Michael Wejchert, Elliot Gaddy and I were up at Cannon a few weeks ago, just as things were shaping up and we decided to climb the first pitch of Sam's Swan Song. As the day warmed, ice began to rain down and we bailed. As we walked back down through the sketchy, lightly iced, seriously loose talus I kept looking over at Mean Streak. It looked like it was in shape. I kept thinking "why didn't we go over there today?" Last winter I watched Bayard Russell, Matt McCormick and Freddie Wilkinson dance up this steep shady route as I failed on Omega yet again. Cannon, it seems, has me figured out. I've spent the entire year thinking about that Mean Streak. I knew Silas Rossi and Peter Doucette climbed it this season and I was eager to try it myself. Knowing my chances were growing slimmer as the narrow WI6 column at the start grew older and began sublimating, I began to get anxious. Cannon was actually keeping me up at night. 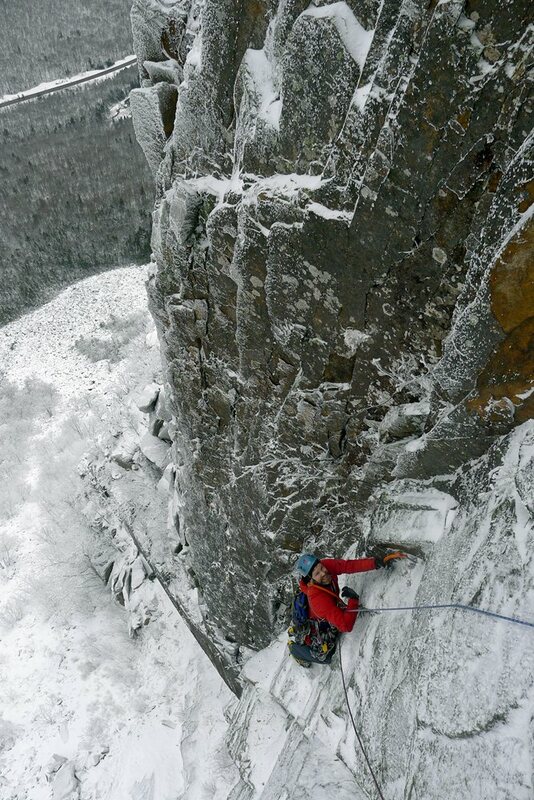 Alden Pellett and I made plans to meet on Thursday before Christmas to climb. We were hoping to find new routes in Smuggler's Notch. On a last minute whim, at 8:30 the night before, I called Alden and told him I wanted to go to Cannon. He said he'd meet me there at 7 the next morning. Along with Michael Wejchert and Peter Doucette, we headed over to the Omega amphitheater. Michael and Peter decided to climb the Henderson Buttress to Pilaf, a beautiful 5.9 handcrack. Rime-covered rock made their outing feel very Scottish. Alden graciously obliged and I took the first lead. I'd been waiting a long time for this, and I was anxious; Cannon has a way of doing that to me. I started up the route. Good rock gear near the start of the ice helped calm my nerves temporarily. I slowly and methodically picked my way up the narrow, 4" thick strip of ice. I stretched out right to place a bomber 3" cam. As I continued up my hands went numb and I began to sweat. When I read Will Mayo's first ascent report I remember thinking "WI6?". There aren't many routes deserving of that grade in the Northeast. I was skeptical. New England modesty has kept most hard ice routes in the WI5+ range. As I forced my body right, even though the ice was on the left, and struggled to protect the dead-vertical 4" thick, 2' wide strip of ice it occurred to me why Will Mayo, one of the Northeast's most talented winter climbers, was calling this section WI6. I had been bare-handing icicles, trusting so-so tool placements, and trying to find good stances despite the fact that there weren't any. At the end of the ice, below a roof I found my first really good stem and caught my breath. I found 4 semi-mediocre gear placements and launched into the mixed climbing above. After several tool placements in turf that looked good but was actually poor I reach a flake that swallowed my picks. Relieved and elated I began placing small but solid gear and stemming up the corner. A little while later I reached the traverse where Will and Andy (and Peter and Silas) exited the corner. I slung a giant detached obelisk and began traversing through snow-covered slabby rock to another corner. Rope drag made these moves tricky. I'm not sure why I was surprised, everything up to this point had been hard. A few minutes later I was off belay at a small square stance. Alden took a hike to warm up and I stacked ropes in lap coils at my waist. By the time I pulled all the rope up Alden was ready to go. Alden, who claims he's out of shape (with a full-time job) dispatched the pitch easily. Not long after starting he was at the belay. 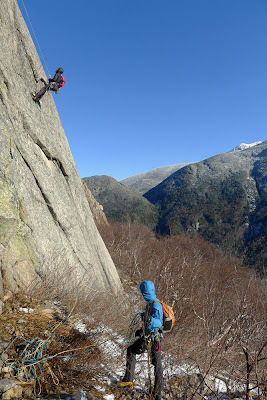 We continued up the wall, me leading and Alden following for the remainder of the route. 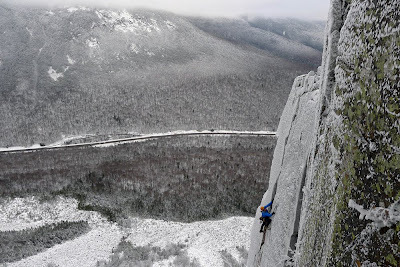 Steep, secure climbing punctuated by short insecure sections defines this excellent route. 30 feet from the end of the hard climbing I surrendered the lead to Alden. I was tired and it was getting late. Alden comfortably lead the final, loose 30 feet and belayed above. Not long after we were rappelling from the top of Pilaf. Even during descent, Cannon has it out for me. Peter and Michael left an anchor on top of Pilaf. They had some trouble pulling their ropes but managed to get them back. Assuming their trouble was due to a lack of "rap rings" I left two bail carabiners on their slings. Safely on the ground, we pulled with all our might. Our ropes would not budge. In the darkness, we opted to leave them. I would come back for them the next day. The next day, Friday, I returned and retrieved the ropes from above. In driving rain and howling wind I waded through wet snow and managed to find the top of Mean Streak. Silas had given me a few landmarks that made the task a little less daunting. I rappelled through slabby, vegetated terrain, put the soaking wet ropes in my Bullet Pack and began rope soloing back up the cliff. I had no issues, except for the fact that I had a pack full of four soaking wet ropes and a 40-minute descent down and icy, slush-covered trail. It's interesting. Mean Streak has temporarily satiated my appetite for hard winter climbing. The climb was a major tick on my list, and I've been sleeping better knowing that I don't have to get up at 3:30 a.m. again to go to Cannon anytime soon. For so many years I just climbed things because I'd never done them before and success came easily. I still do this to some extent, but my efforts are much more pointed, and when trying many of the Northeast's harder lines success doesn't come right away. It's a hard lesson to learn, but a good one - success frequently rides on the back of failure. You can't really have one without the other, especially when you're trying you're hardest. Google+ gallery of images for this post can be found here.